This week: Yet another reason to replace those fluorescents, LED lighting's limited penetration of the UK retail market, and Isotera's contactless power. Isotera has introduced iPower, a simplified system for driving, powering, and controlling LEDs that do not have integral drivers. The UK company says the iPower system can reduce installation time and costs by 50-60%. The iPower backbone distributes DC power to LEDs; the components, including lighting controls, plug together in the manner of Legos. GreenBang.com reports that Isotera's technology "combines a single power hub and cabling with clips that connect LED lights to the power source quickly and easily without exposing live wires." The physical distance of driver from LEDs simplifies heat management. This quick video sketches out the installation process. 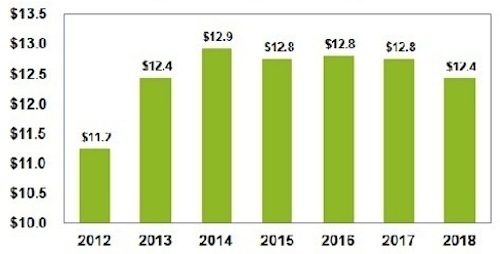 A new report from IHS, "Quarterly GaN LED Supply and Demand Market Tracker: Q4 '13," states that worldwide revenue for GaN LEDs rose 10.6% in 2013 over the previous year. But IHS projects that 2013 will be the last year of double-digit growth. After growing around 4% in 2014, revenue will remain flat for a number of years. Unit shipments are expected to continue to rise, but more slowly than in the past -- in the range of 3-4% from 2015 through 2018. Global GaN LED market revenue rorecast, in billions of dollars. For building owners who need a push to move to LED lighting, here's a cautionary tale. In Los Angeles, the 41-story Ernst & Young Plaza office tower has been emitting radio frequencies that interfere with Verizon Wireless's 700-MHz network, according to a citation issued recently by the FCC. The culprit: faulty fluorescent lighting, specifically the ballasts. GE, which made the lights, issued a customer bulletin in 2012 warning that a small number of its UltraMax ballasts unintentionally produced just such high-frequency radio emissions as the FCC measured. The bulletin went on to describe how to exchange the faulty units. This building's owner either didn't get the memo or didn't act on it. Now the penalties could include fines of $16,000 per day, criminal sanctions, and jail time. The Building Research Establishment has updated a survey of the retail lighting landscape in a small town in England. From that survey, the nonprofit extrapolated that LED lighting accounts for 5% of the lamp stock across the country's shops. This is up from 1.5% in 2011. About 10% of shops in the UK use some form of LED lighting. In 2011, the BRE found that the most popular form of lighting was fluorescent T8 with a share of about 40.7%, followed by T5 at 22.4%. Halogen and CFL each claimed around 11%.